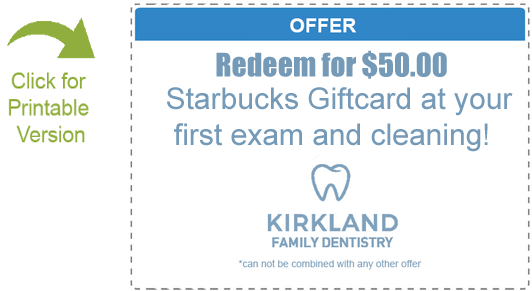 Thank you for your interest in becoming a patient of Kirkland Family Dentistry. We strive to provide the best dental service for patients in the greater Seattle area. Our award-winning dental office provides you with everything you need to maintain good oral health, now and in the future. We provide quality, individualized dental care so that you don’t feel like just another number. From the moment you walk into our office, you’ll feel welcomed and understand how important your oral health is to our staff and dentists. We offer high-quality dental services at affordable prices because we know how important it is for patients to have access to dental care that matters. We work to provide you and your family with the right care, at the right time, for the right price. We’ve made it our mission to create long-term relationships with our patients. Whether near or far, we work to provide you with a caliber of dental care like you’ve never seen. We service patients from Kirkland and nearby areas such as Market, Norkirk, Crestwoods, South Juanita, and Forbes Creek. We promise our clients quality care for your family’s oral health that is customized to your needs. Our patients are important to us, and we are so proud to serve you in the Kirkland area. Being an award-winning dental service doesn’t mean we take our work for granted. In fact, we rise to the occasion again and again and ensure that patients continue to vote us Best Dentist in Kirkland now and for many more years to come. From the moment you step foot into our Kirkland, WA dental office, you’ll feel at home. Our staff will assist you with any questions you have. Our dentist will examine your teeth, mouth, and gums. You’ll be asked some questions about your general and oral health and some x-rays may be taken to create a baseline for your patient file. This will also help us to spot any issues that may be going on below the tooth’s surface right now. During follow-up visits, you can expect regular check-ups, examinations, x-rays, and interventions for issues as they arise. At any time, you can call our office with your questions or concerns, and our friendly and knowledgeable staff will be happy to help. 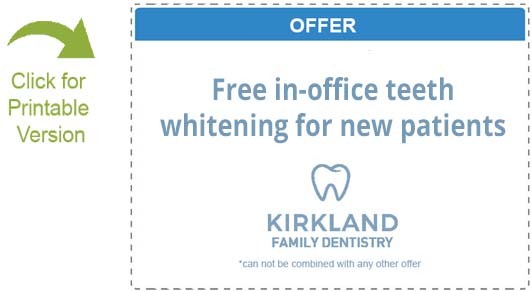 Our office takes pride in being one of the most highly recommended dental offices in Kirkland. If you’ve been referred by a friend or family member, please let us know. We wish to thank our loyal patients for their continued patronage. 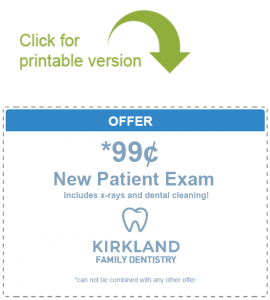 To make your first visit to Kirkland Family Dentistry easier, please take a few moments prior to your appointment to download, print, and fill out the forms below. This information helps us create a picture of your oral health, as well as your general health, and have an understanding of your payment method, insurance, and more. We believe that world-class dentistry doesn’t have to come with a big price tag. For this reason, we provide high-end services at affordable prices. In fact, we are so sure you will be satisfied with the price of our quality work that we encourage our patients to call around to other offices to inquire about pricing after visiting our office. You’ll be surprised to find out how dental costs can range so dramatically. We are pleased to accept a wide range of insurance carriers to ensure quality care for as many people as possible. We are always adding new insurance carriers to our list of qualifying insurance carriers. If you aren’t sure if your insurance policy is covered, just give us a call at (425) 822-0435 and we’ll be happy to help. If you don’t have insurance, don’t let that stop you from getting the quality dental care you need. Call our office to learn more about your payment options and to find out how you can get the help you need without breaking the bank. Whatever your needs, we are here to help. If you want to learn more about how to maintain good oral health or have been thinking about improving your smile, simply contact us. Please reach out to us at (425) 822-0435 or schedule an online appointment. 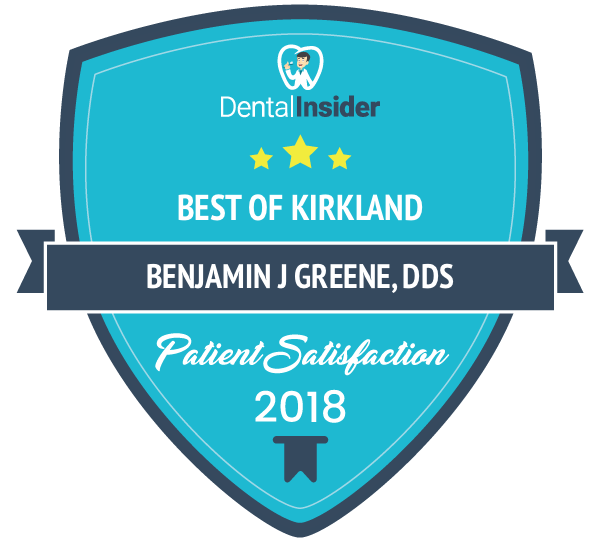 Find out for yourself why Kirkland Family Dentistry has been voted the Best Dentist in Kirkland year after year!